The Nuhfer family, owners of BarLee Jerseys, hosted a pre convention meeting of the international members of the Jersey Association on Tuesday, June 26, 2018. Some of the countries represented were the USA, the Isle of Jersey (origin of the jersey cow), UK, France, Spain, Germany, Belgium, New Zealand, Australia, Brazil, and Argentina. Jeneva Auble, Centerra Co-op, and Amy Nuhfer answered questions about calf care. Dr. Dwight Roseler, Purina, answered questions regarding rations and animal husbandry. W. G. Dairy addressed robotic milking system questions. 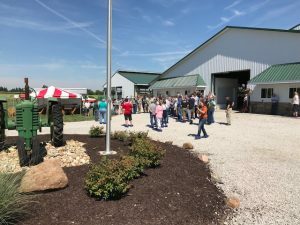 Lunch was hosted by Centerra for the approximately 150 producers in attendance. This was a unique opportunity to showcase our industry and to meet the international Jersey community.